Mark Bittman describes scallops as "creamy and sweet, briny and meaty, all at the same time, scallops are the most user-friendly of mollusks...."
How much do I love scallops? Scallops are one of my favorite seafoods. 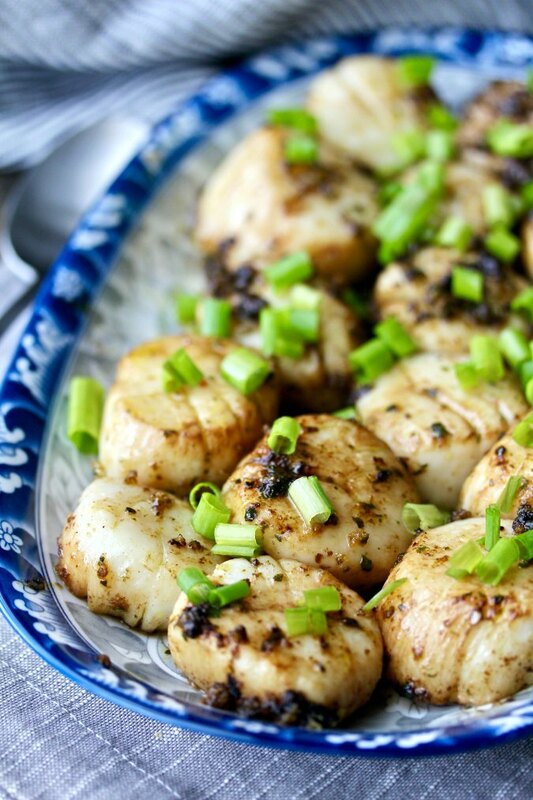 I have lots of scallop recipes on this site, including.. This baked scallop dish is right up there in deliciousness. You can customize this recipe by substituting whatever flavors you like, such as garlic, mushrooms, herbs, caramelized onions, chiles, and/or capers. Next time I might try chipotles in adobo sauce. All you need is butter and your imagination. For the olives in this recipe, you can either chop up some black olives or add a few spoonfuls of olive tapenade. For the sun dried tomatoes, you can use either oil packed or the packaged dried. If you use the dried non oil packed, soak the tomatoes in very hot water for about 30 minutes. This recipe has been inspired by the book Mark Bittman's Kitchen Matrix: More than 700 Simple Recipes and Techniques to Mix and Match for Endless Possibilities. Over 700 recipes in 300 pages. Our inspiration this week is the chapter, Scallops +12 Ways. There are two sections: grilled and raw. I didn't want to make a raw scallops recipe because I wasn't sure I would get access to sushi quality scallops. 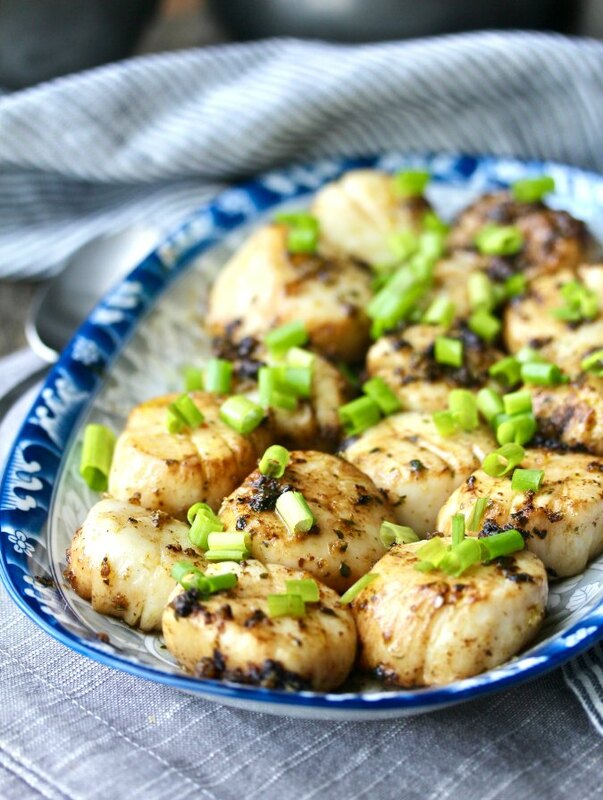 The grilled scallops in the book look fabulous. Still, I decided to go rogue this week and prepare a baked scallop dish. I'm spending the year cooking through sections of the book with Wendy of A Day in the Life on The Farm and Camilla of Culinary Adventures with Camilla. I've been pretty much the "good girl" of the group, making the actual recipes from the book. It feels good to go rogue. Let's see what Camilla and Wendy made! Did they go rogue? With a rack in the upper third, heat the oven to 450 degrees F.
Mix the melted butter, olives, sun dried tomatoes, basil, and garlic and pour the mixture into a small baking dish. Sprinkle the scallops with salt and pepper and place them in the baking dish, turning them in the butter. Bake the scallops for 10 to 15 minutes, depending on their size. Do not over bake. It's better to err on the side of underdone. Let the scallops rest in the pan for about 5 minutes before serving. Haha! Yes, I do go rogue at lot! This recipe looks fantastic, Karen. That recipe sounds amazing Karen. We love scallops too so I'm happy to have a new recipe. These one baked in butter are so easy peasy! We are big scallop fans here also. This recipe looks delicious and I'm going to check out your other scall0p recipes also! I'm such a scallop fan though I was just thinking recently, it has been a while since I had them so must have some soon. This looks like a delicious way to have them. I've never tried baking them. I hadn't before this recipe. It's a revelation! mmmm! 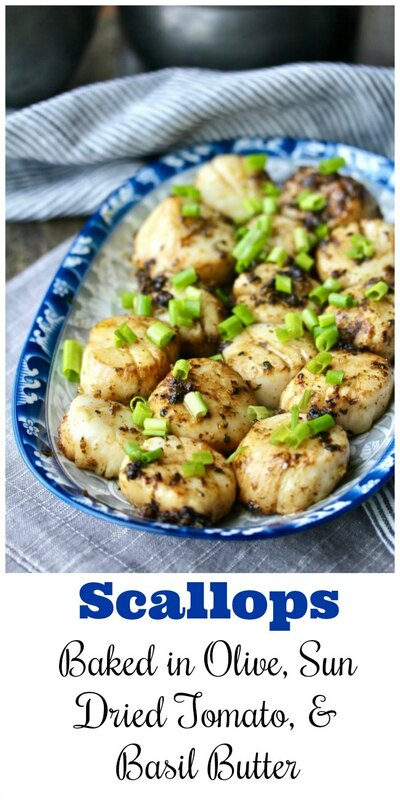 I love scallops and this dish looks like a must try! What a great, light dish! We loved it, and it is very light for sure.